We have the following prompter gear available. It will be delivered and operated by an experienced professional. Click any tab below to get prices and detailed information on all rental options. This is a professional through-the-lens unit. 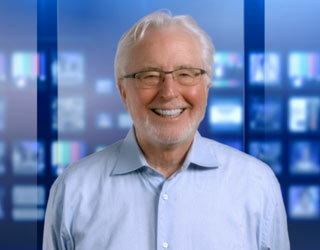 We offer a variety of teleprompter models including Autocue, Telescript and Prompter People. Our prompter mounts to a 15mm rod system. This unit achieves the effect of the talent looking directly into the camera while reciting copy much like news anchors do. Setup takes less than half an hour, and the operator works with talent to adjust the font size and anything else so that he/she is comfortable reading off the prompter. We strongly suggest sending a script (in Word format) to the operator in advance. However, giving the script to the operator on the set is also fine. He/she has the ability to make edits at the last minute when the teleprompter is not in use. Clearly, we prefer to lessen stress by being prepared. Price: $945/10 Hour Day with operator. 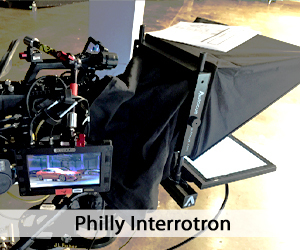 The Interrotron is a great option for interviewing talent with no experience, as the unit is designed to produce an intimate conversation between the director and talent, helping them appear more natural on camera. 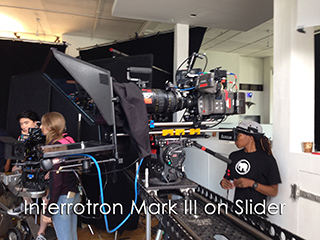 The Interrotron Mark III contains two separate units: a director’s unit and a talent unit. The director’s unit allows the director/interviewer to not only converse with talent face-to-face but also to monitor the footage (lighting, framing, etc.). The talent unit projects a live feed of the director to a piece of glass placed in front of the camera. While the talent/interviewee speaks to the director, it appears (on camera) that he/she is looking into the lens. The Interrotron Mark II only contains a talent unit that pulls a live feed of the director’s image. While this unit still achieves the natural effect of talent looking directly into the camera, the director is not able to monitor the footage being captured as he/she must look into the camera that is sending the feed to the talent unit. 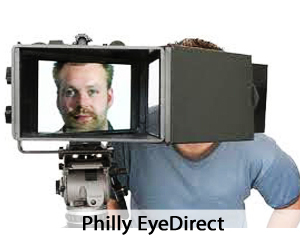 For shoots with a smaller budget or extensive travel, we strongly recommend using the EyeDirect. Available for pickup from NYC office or by shipping. The EyeDirect functions like the standard Mark III Interrotron in that both talent and director are able to see each other “face to face”. It does not use power as it relies on a mirror system to achieve this effect. This unit is NOT ideal if the camera is not stationary. 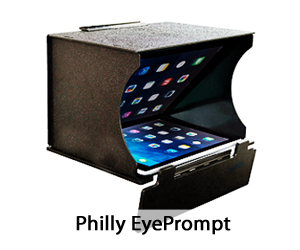 This unit includes an iPad mount so that it can also be used as an iPad prompter (iPad not included). The unit comes in a custom-fitted Pelican case and is packed ready for travel. The case weighs 30 lbs and is just a bit larger than the typical airline carry-on bag. 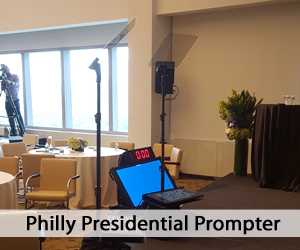 The Presidential Teleprompter is used at many live events, from conferences to graduations, to award shows, and as the name suggests, presidential speeches. The two glass panels allow the speaker to easily access the script and look at the audience, instead of staring down at notes. The audience sees through the glass, giving them an unblocked view of the speaker. Robotic Presidential Teleprompters allow for electronic panel adjustment. This is ideal if more than one speaker uses the unit. Before each individual takes the podium, the operator remotely adjusts the panels to suit the speaker’s comfort instead of going on stage and adjusting each panel. This allows for a seamless transition between speakers. 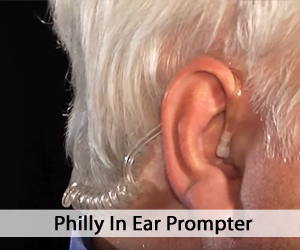 We strongly suggest allowing the teleprompter operator to arrive at the venue a few hours before the start of the event so that he/she can work with talent and adjust positioning and script fonts for optimum comfort. Although we rarely have tech issues on set, all operators come with a backup laptop. “A List” Talent We Have Prompted For. Click Here. 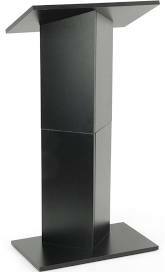 When a speaker is not standing at a podium, he/she is most likely delivering a message while walking on stage. 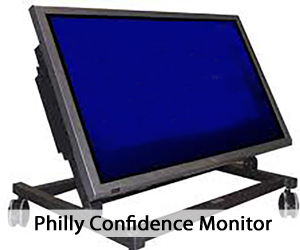 Also known as the Rock n’ Roll monitor, confidence monitors give talent the independence to use the space of his/her surroundings while still maintaining ease of access to written copy. The monitor(s) can be placed on stage, off stage or behind the audience. Price: $95 without iPad; $120 with iPad | Stand not Included. Available for pickup at our NYC office or shipping. 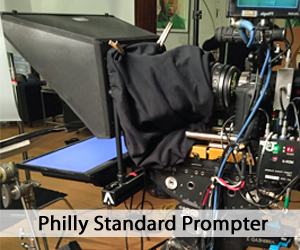 This unit is a low-cost alternative to a standard through-the-lens teleprompter. It is ideal for small productions or shoots with extensive travel. Please note that many iPad prompter software does not allow speed adjustment once the scroll begins. This can sometimes make the talent sound robotic – especially when reading multiple pages of a script. Medium wooden podium with Podium Prompter (not visible). This unit is a thin prompter monitor that rests on top of the podium, out of sight of the audience. A cable connecting the monitor to the prompter software is run down the inside of the podium and along the floor. The speaker glances down at the top of the podium to view the script as if he/she were referring to notes, without the hassle of handling a stack of papers. Please call Bill at 917-414-5489 or Jocelyn at 646-617-6535 for more information re availability and pricing. Click on the button below and then call Bill at 917-414-5489 or Jocelyn at 646-617-6535 for types, availability, and pricing. I am working as a production office coordinator and Teleprompter Operator. The American Movie Company hired me three years ago. I have done gigs here and in New Jersey. I am training other staff members who want to widen their interests. AMC encourages diversity in all areas. We’re scheduled to work on a film in February. It will allow us all to participate. We are providing the entire crew. It is rumored to star Tom Hanks. Don’t know much more at the moment. Will keep you posted. 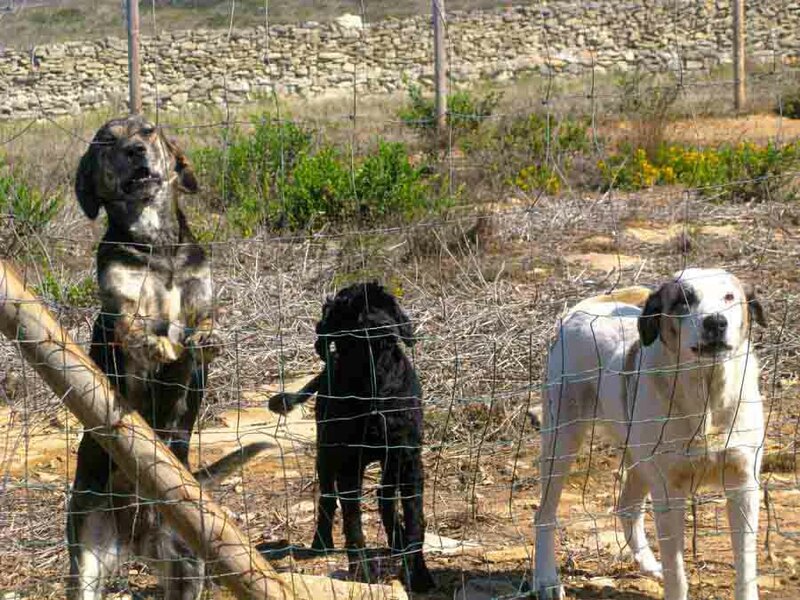 To the left are my girlfriend’s dogs! Each is unique and oh so friendly. We are lucky enough to have a big house and property out back. One of our clients actually asked if they could be in their film! Yes! they eat a lot! Philadelphia is full of rich American history, from the Liberty Bell to Independence Hall. The city was instrumental to the American Revolution. It also served as the capital of the United States while Washington DC was built. 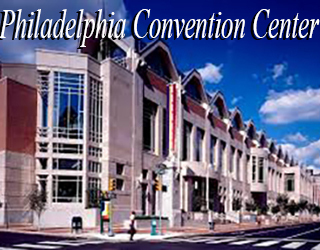 Philadelphia is also a popular backdrop for a multitude of film, television and art projects. The most iconic of which are the steps of the Philadelphia Museum of Art, which appeared in the running scene in Rocky. The steps are so popular that they are also known as “The Rocky Steps”. Tourists of all ages climb up the steps every day and strike the famous triumphant pose from the film. Other films that have been shot in the city include The Sixth Sense, The Lovely Bones, and Silver Linings Playbook. When you avail yourself of our Teleprompter Rental you also get a fully proficient operator in both the software and the setting up of said device. 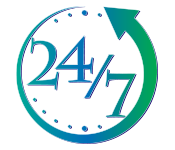 Our operators are experienced experts and know how to make talent feel calm and relaxed. 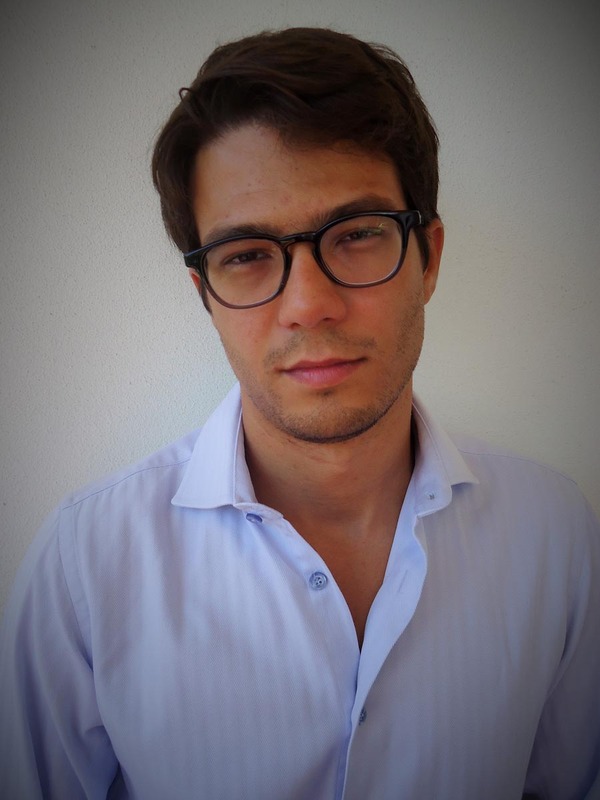 It’s critically important that the operator establish a rapport with the talent right away. The mark of a seasoned operator is the ability to anticipate a problem and solve it. 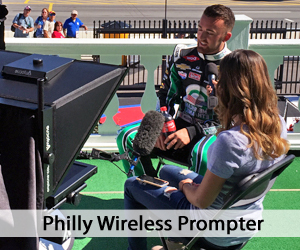 A connection between talent and teleprompter operator is important. This empathy will lead to an effective, successful job. 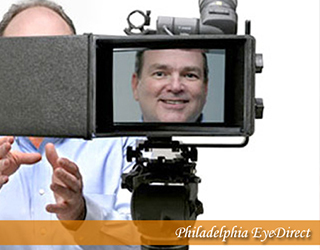 We Extend Our Teleprompter Services to Trenton, Atlantic City, and Central New Jersey. 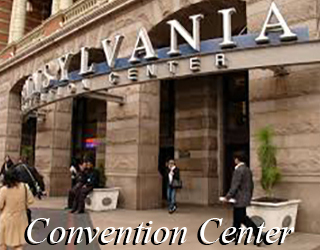 The Philadelphia Convention Center consists of over 2,000,000 sq. ft. of space, 679,00 of which is exhibit space. There are 82 meeting rooms that can seat both small and large crowds. The center also boasts the largest ballroom in the Northeast, clocking in at the size of a football field. 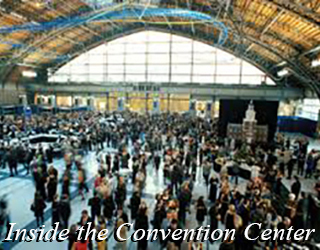 The Philadelphia Convention Center plays hosts to a multitude of annual events and conventions. 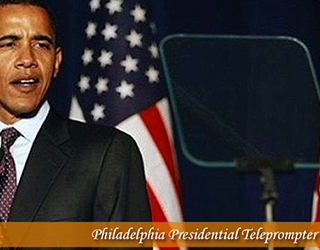 We service the center with presidential prompters, standard prompters and confidence monitors. In West Philadelphia Born and Raised….